So this week, I'm volunteering for Vacation Bible School at my church! Woohoo! Super-fun, but means I have no life for the week. Luckily, I have some amazing guest posts lined up for all of you! Today's post comes from Elisa, whom somehow I didn't meet until recently. As a fellow diabetic who has also recently started trying to get a better handle on things, Elisa has helped me a lot. See this post from last week. Elisa blogs at Just a Nerd Trying To Make A Difference, and you can follow her on Twitter. Ohhhh candy bar! Time to eat that without checking or taking insulin. 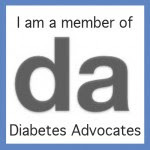 This is how I lived with diabetes for a good 18 years. I never really thought about the transition from a "out of control" diabetic to an "accepting my disease" diabetic, until Jess asked me about it. It has not been a drastic change for me in the sense that I kind of still do eat whatever I want but I at least check my sugars and dose for it now. My main concern at the time I decided to deal with my diabetes was getting rid of the mind numbing headaches I lived with all my life. I would literally say to myself if I went one day without a headache "what's wrong with me today?" So to me once I noticed the change in my internal mood and that I didn't get headaches so often if at all is what made me realize I finally made the right choice. Sure I would love to get an A1c of a 6.5 but its something Im willing to achieve with baby steps. What good is an A1c of 6.5 if my sugars run 40 then 400 in a day? I like to look at the big picture and I know an A1c doesn't speak to everything. My A1c was always high an ranged around a 10, but the one day my parents forgot to give me my insulin (dad would do nights and mom would do days, mistakes happen), I don't blame them for thinking the other was giving me the shot. That night my A1c jumped to a 13. Until I can actually compare good numbers to my A1c, im not going to be completely satisfied or feel accomplished with a lower A1c. Though as of using the pump I can definitely see an improvement. Right now I'm just happy to be alive and living without complications. Life for me since taking control of my diabetes has been amazing. I don't feel like death every single day. Honestly, ever since the depression is gone, nothing is holding me back anymore. The best thing I would say about this transition is that I can finally accept that I have diabetes and don't feel like I have to hide it from everyone. I feel like spreading awareness everywhere I go now! Thanks Elisa! So happy to have met you! Also, if you haven't seen Elisa's You Can Do This project video, you NEED to watch it! Seriously! Elisa, you are so brave for telling your story and finding help when you needed it. It's awesome that you've become such a supporter for others dealing with D. Way to go!! !